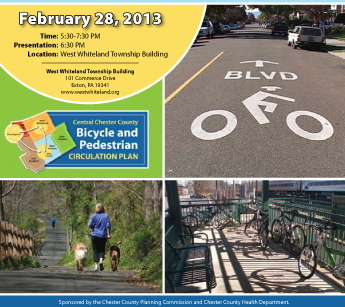 The meeting offers the public the last opportunity to provide feedback before the Chester County Bicycle and Pedestrian Circulation Plan is finalized in March. Attention biking/hiking enthusiasts: The Chester County Planning Commission and the Chester County Health Department would like to invite residents interested in making the community more bike and pedestrian-friendly to the final, public informational meeting of the Central Chester County Bicycle and Pedestrian Circulation Plan. The meeting will be held Thursday, Feb. 28, at the West Whiteland Township Building, 101 Commerce Drive, Exton. A walk-through will be available from 5:30 to 7:30 p.m.; a presentation is scheduled for 6:30 p.m. The plan addresses how to make improvements to seven municipalities in the center of Chester County: Downingtown Borough, East Bradford Township, East Caln Township, East Goshen Township, West Chester Borough, West Goshen Township and West Whiteland Township. Meeting attendees will have an opportunity to voice their opinions, concerns and ideas regarding the plan and its impact on the entire study area. The meeting will feature plans for over 37 miles of new trails, 21 miles of proposed bike lanes, and 62 miles of additional sidewalk in the Central Chester County region. Cost estimates, a list of priority projects, and an action plan of recommendations will also be presented. Anyone who lives, works, or plays in any of the plan’s regions is encouraged to drop by and share input. For more information or to review documents, visit www.chesco.org/planning/cccbikeped, or contact Randy Waltermyer, transportation planner/project manager, at 610.344.6285 or rwaltermyer@chesco.org.